Caveat emptor. 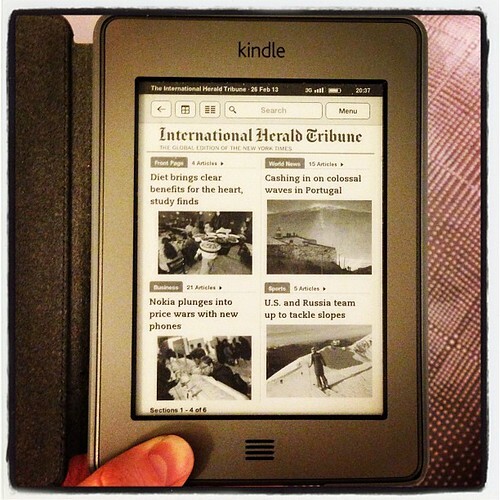 The Kindle, the iPad and many digital devices are actually marketing channels. Or at least that is one of the things that they are, but I can confirm it – it has caught me out. It is entirely possible that Amazon do not make much money on the Kindle devices themselves. They probably make more money on the books and newspapers that the device is a delivery mechanism for. Apparently Microsoft do not make money on selling Xbox consoles – they make money on the games, movies and music that the Xbox delivers. Why have I been caught out? This evening I decided to check through my Kindle book collection and I was shocked to see that over the past 3 years I have purchased about 50 books that I have not read or looked at. Digital clutter does not matter as much as physical clutter but having these books is a waste if I don’t actually read them. Read the digital books that I’ve got. Read the remaining paper books – about 15. Finish the five or so in progress, or declare them abandoned and move on. Ue the Amazon prime rental facility more – most books do not need to be kept after they have been read once. Posted in Minimalism, Shopping, Technology and WebBookmark the permalink.